Did you go "ohhhhhh!" when you saw this? If not, are you awake? Go get another cup of coffee. I'll wait. 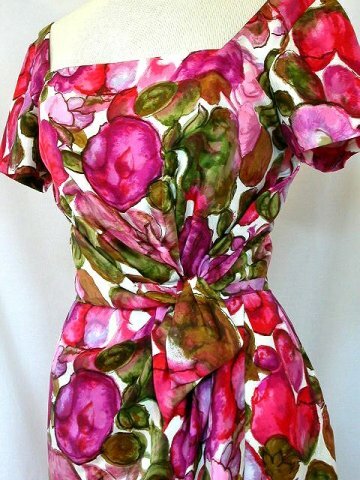 This very nicely sized (B38/W29) dress is $350 at memphisvintage.com (click on the picture to check out the site, and many other wonderful pictures of this dress). This is by Ceil Chapman, who was supposedly Marilyn Monroe's favorite designer — can you see why? Magenta fixed!The 23″ waist boggles, a bit, but remember that this was supposed to be worn with industrial-strength underwear — at least a serious girdle. Here are the results of a search of “dresses” of royalty free images of the CSA Collection on veer.com. CSA is the design firm that created the identity for Fossil. You are right, that dress did cause a sharp intake of breath.There needs to be a dress-making advice column. I saw dupioni silk for 50% off at the fabric store today, but I stopped myself from buying any. Everything I thought of to make with it was too fancy for my usual out and about places. I find myself having non-buyers remorse. now this is a total yes my sis buys things like that and guess what??? ?she has fashion…..i think its gorgous don’t you??? ?